Oh, brunch, how we adore you. When someone else does all the work that is, and the dishes. We totally don’t blame you for thinking throwing an epic brunch is a whole lot of work you just don’t have time for – we used to think that too. Until we learnt this nifty little formula that makes brunch prep easier than the ABCs. 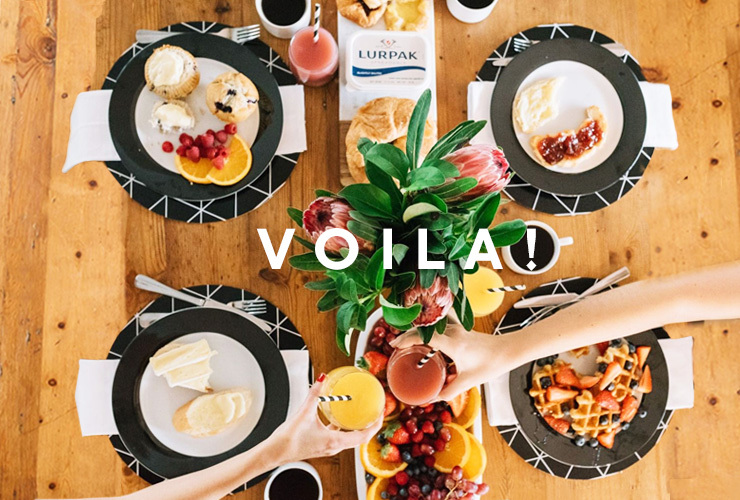 We teamed up with the brunch experts at Lurpak to let you in on the secret to throwing a killer brunch. Ready to take things up a notch? Obviously, you want your brunch to look amazing. Make sure you’re prepped with crockery to impress your guests and some fresh blooms to set the scene. Treat this step as laying down your foundation; it’s vital! Buy your place settings in monochromatic colours rather than unique, intricate patterns so you can mix and match them if for some reason (dirty or smashed dishes, anyone?) you don't have the full set on hand. Genious! Plus, less busy patterns allow the food to shine. It's the star of the show, right? Brunch calls for all the sweetness and all the buttery goods. Add croissants, muffins and pastries to your list if you want to wow your guests. If you want to seriously impress your guests you can make them at home. To whip up a super easy croissant minus the effort cut a square of buttered up ready-made puff pastry intro triangles and then roll them into croissant shapes. Waffles are just as easy to whip up in a waffle maker, you can even add melted butter to your batter if you want to really wow your guests. If you aren't exactly chef material, you can pop your store bought pastries in the oven before your guests arrive so they're nice and toasty warm. Your guests will think you're a regular Heston Blumenthal when the butter melts into their deliciously warm treats. 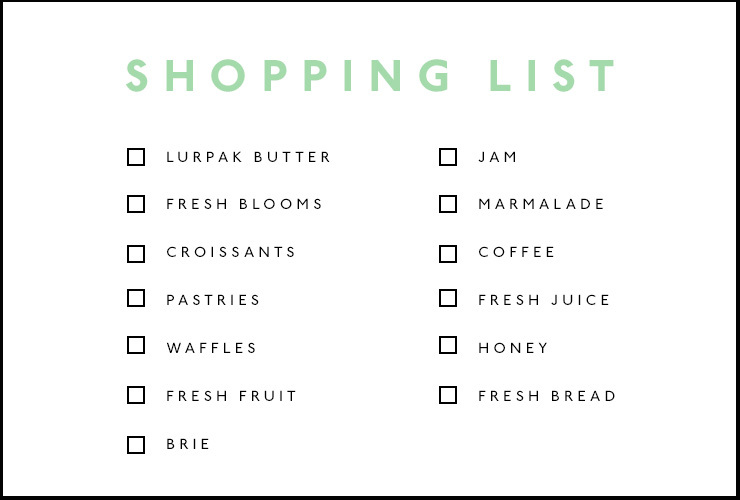 Don’t forget to fill your shopping basket with fruits too, to bring a hit of freshness to your spread. Chop your fruit up into bite-sized pieces and pop them on a longer platter to create the illusion a bountiful plate. Bonus tip: if you put the larger fruit on the bottom of the plate it will look fuller. Being parched at brunch is not cute. Make like a great host and have your tipples ticked off before your guests arrive. We’re all about fresh juices, champagne, coffee (of course!) and sparkling water. Who doesn’t love being greeted with a drink? A coffee plunger is your best friend, as guests can customise their coffee as they go. Create some freshly squeezed juice combos like orange, mint and passion fruit or mixed berries if your friends aren't quite feeling the coffee vibes. Alternatively, pour some chilled pre-made juices into glasses over ice and finish them off with an adorable paper straw. Now comes the fun part, eating! Pile up fresh fruit, drizzles of honey and lashing of butter onto your waffles to create an effortless brunch meal that will wow your guests and have them begging for seconds. Serve your freshly made (or, warmed!) croissants with lashings of butter and oodles of condiments. To impress your guests simply pop some strawberries and sugar in a pan over a low heat to make fresh jam. Croissants with jam and butter - could anything be better? Serve your muffins with piles of fresh fruit and dollops of butter. If you want to be really fancy you can even slap some jam on. A fresh, crusty loaf of bread with butter and brie is one of life's greatest pleasures. To whip up the home-made version it's as simple as can be. Activate some yeast in warm water, melt some butter (the secret ingredient) and add it to the yeast along with your flour and sugar. Give it a stir until a lumpy, thick batter forms, add more flour until you're at dough consistency. Keep kneading until you have a smooth ball, then pop it in an oil-greased bowl to rise. After the dough has risen bake in a greased loaf pan and cook for around 30 minutes until golden and risen. Too easy! Top with butter and brie while still warm for a seriously tasty treat. Now you’ve got all the skills down pat – get to shopping! Fret not, we’ve whipped up this handy dandy list to nail your brunch debut. Editors note: This article is sponsored by Lurpak and proudly endorsed by The Urban List. Thank you for supporting the sponsors who make The Urban List possible. Click here for more information on our editorial policy.